MARYSVILLE — The Miami East-MVCTC FFA Dairy Cattle Evaluation team members recently wrapped up a spring season of career development events. Practice sites that enabled the students to learn include Quietcove Holstein Farm in Wapakoneta, Knoop Holstein Farm in Fletcher, Hershberger Jersey Farm in Troy, Buschur Dairy Farm in New Weston, and Bair-Trax Farm in Troy. On March 3 at the Marysville/Champaign County Invitational in Marysville, the Dairy Cattle Team placed 19th out of 45 teams and consisted of Michael Bair, Carter Gilbert, Elizabeth Bair, and Makayla Brittain. Michael Bair was the highest placing individual from Miami East at 12th out of 189 contestants. 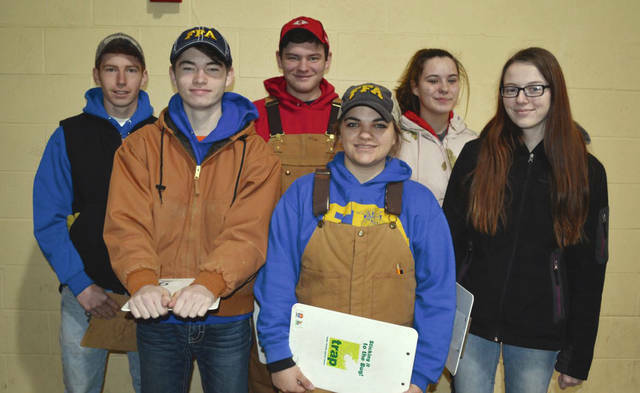 On March 10 at the Miami Trace FFA Invitational in Washington Court House, the Dairy Cattle Team placed eighth out of 30 teams and consisted of Jayden Gates, Ethin Bendickson, Michael Bair, Elizabeth Bair, Carter Gilbert, and Makayla Brittain. Jayden Bair was the highest placing individual from Miami East at 26th out of 93 individuals. On March 16 at the Mercer County FFA Invitational in Celina, the team placed 17 out of 72 teams. The team consisted of Elizabeth Bair, Jayden Gates, Carter Gilbert, Michael Bair, and Ethin Bendickson. Elizabeth Bair was the highest placing individual from Miami East and placed 24 out of 128 individuals. The State Dairy Cattle Evaluation Career Development Event was held March 28 at the Ohio State Fairgrounds/Expo Center. Team members were Carter Gilbert, Michael Bair, Jayden Gates, Elizabeth Bair, Makayla Brittain, and Ethin Bendickson. The team placed 17 out of 72 teams. The highest individual from Miami East was Carter Gilbert placing 33 out of 395 contestants.